Rarely will you find a residence of such distinction which offers equal amounts of sophistication and soul. Embracing you with its warmth from the moment you arrive, you’ll fall in love with this modern masterpiece which boasts a striking monochromatic colour palette throughout, blended with contemporary architecture and design. Featuring multiple living and entertaining areas including a home cinema, an enviable alfresco area with built-in kitchen and vast pool and spa, 21m private sandy beach, spectacular skyline views and a sought-after north-to-water aspect on a wide canal, this is resort style living at its finest on an 827m2 waterfront block. The tone of impressive elegance is set from the soaring ceiling void in the foyer and sweeps through to the vast open plan heart of this home. This decadent space boasts a gourmet kitchen with a waterfall edge Caesarstone island bench, 2-pac cabinetry, acclaimed Miele appliances, oversized gas and electric oven and a generous walk-in pantry. Linking seamlessly with the living and dining spaces, it also fuses with the outdoors via stackable sliders for effortless integrated living. Maximising the mighty views and waterfront location, here you’ll find a fully equipped outdoor kitchen with bold red splashback and stone benches, set under a high ceiling void and lined with shutters to eradicate inclement weather. Adding to its resort style appeal, the pristine timber deck meets a Turkish travertine terrace, bordering the large pool and 12-person heated spa. 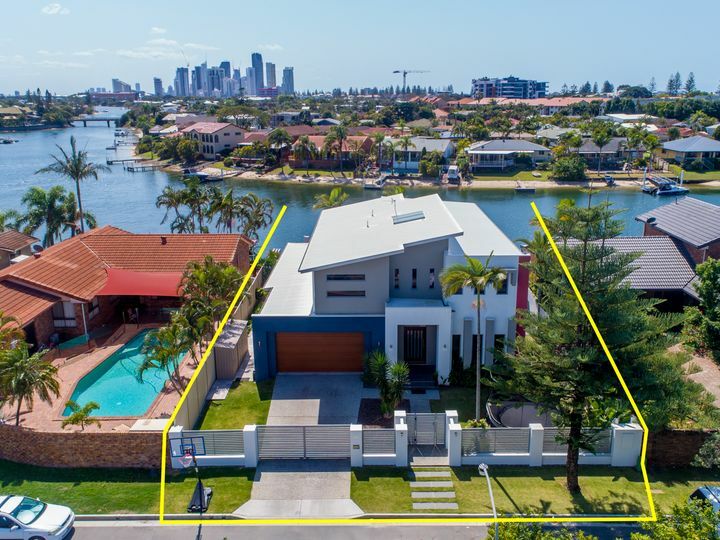 Water enthusiasts will relish being able to take advantage of the boat ramp, boat shed, fully serviced concrete pontoon and sandy beach while movie buffs will be enticed into the cabled home cinema, complete with projector and large screen. The style and substance continue as you ascend the timber staircase, where 4 bedrooms await. The master suite, which is set against the backdrop of beautiful Broadbeach skyline and canal vistas, is flooded with natural light and boasts its own separate parents’ retreat (which could also serve as a nursery), designer ensuite with spa and dual shower, terrace and walk-in-robe. Bedrooms 2, 3 and 4 are serviced by the sleek 3-way family bathroom and each present with built-in-robes, ceiling fans and ducted air-conditioning, which runs throughout the entire property. Other superior features include modern square set cornices and high ceilings, TV points to all bedrooms, executive home office downstairs plus a powder room, retractable alfresco awning and a fire pit, outdoor shower, lush lawns and landscaped gardens, double garage with room for two more cars off-street, crimsafe screens, vacumaid, solar hot water and an alarm system. Perfectly positioned in a tranquil cul-de-sac, and in a high demand suburb, you’ll enjoy being 10 minutes from the sand and surf of Mermaid Beach and a 15 minute stroll to the vibrant caf scene of Nobby’s Beach. Pacific Fair, Star Casino and the best of Broadbeach beckons, only a 10 minute drive away or 5 minutes by boat. You’re also situated in a quiet canal cul-de-sac which equals no through boat traffic and offers direct ocean access. Factor in excellent schools, sports facilities and public transport options close by and here you’ll find everything a family needs to live a lifestyle of easy luxury.